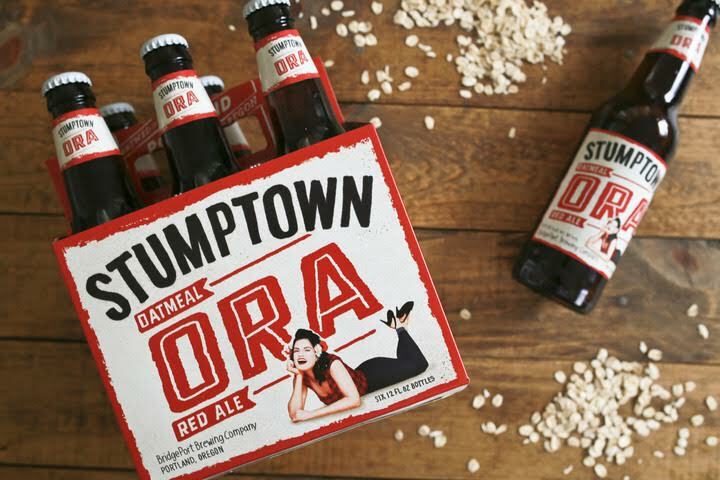 PORTLAND, Ore. – October 14, 2016 – BridgePort Brewing Company, Oregon’s original craft brewery, today announced the release of their newest year-round brew offering, Stumptown Oatmeal Red Ale (ORA). Channeling old school brewing from the 1980s, BridgePort Brewers used four separate hop varietals, Nuggets, Sterling, Cascade and Mt. Hood, in six separate hop additions during the brewing process. This brew marks the first production beer for BridgePort in which the brewers added hops in the whirlpool as well as the first time they have dry-hopped 2lbs/bbl. In addition to the intense dry-hopping, ORA contains a judicious amount of flaked oatmeal, caramel malt, a specialty malt called Red-X, as well as another specialty malt, Midnight Wheat. The combination of these ingredients created a beer with a unique red hue and smooth mouthfeel. Stumptown Oatmeal Red Ale comes in at 5.6% ABV, 14.2% OG, and 48 IBU. The mixture of four hop varietals, flaked oatmeal and caramel malt created a subtle herbal and citrusy hop profile, balanced by a distinct caramel note. Available mid-October in 22oz. bottles, 12oz. six-packs, on-draft at BridgePort BrewPub in Portland, Ore. and where BridgePort is sold. Oregon's oldest craft brewery continues to evolve from a microbrewery to a regional leader committed to producing high quality craft ales. Led by Brewmaster Jeff Edgerton, the team of BridgePort brewers prides itself on using hops from an hour away and clear glacial water from Mount Hood. The BridgePort family of ales includes the Conviction Pale Ale, IPA, Hop Czar Imperial IPA, Kingpin and other specialty styles. BridgePort Brewery is located at 1313 N.W. Marshall. For more information, call 503-241-7179 or visit www.bridgeportbrew.com.